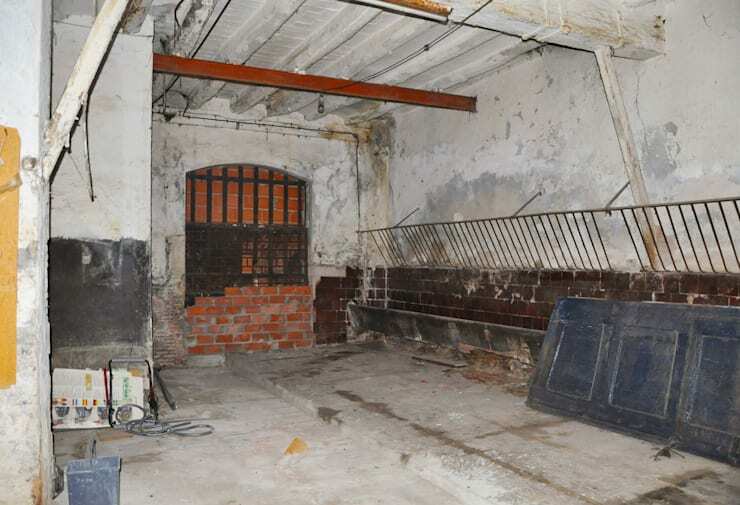 Imagine an old dairy in one of the most popular districts of Barcelona. An unused building, formerly housing cows producing milk, cheese and yoghurt. The building was eventually sold and, over time, became a decrepit, shabby space, desperately in need of repairs. Enter Lluís Corbella and Marc Mazeres, the architect and designer of the abode you're about to experience. Their inventive ideas and design synergy have turned a run-down shell of a building into a modern, industrial masterpiece. To accomplish this feat the designers gutted the interior of the huge space, preserving only the façade and roof, and converting the former dairy into an expansive home, brimming with modern luxury. The result is simply extraordinary, with exposed brick contrasting with pristine white walls throughout, providing a constant reminder of both the history of the home and its contemporary reinvention. 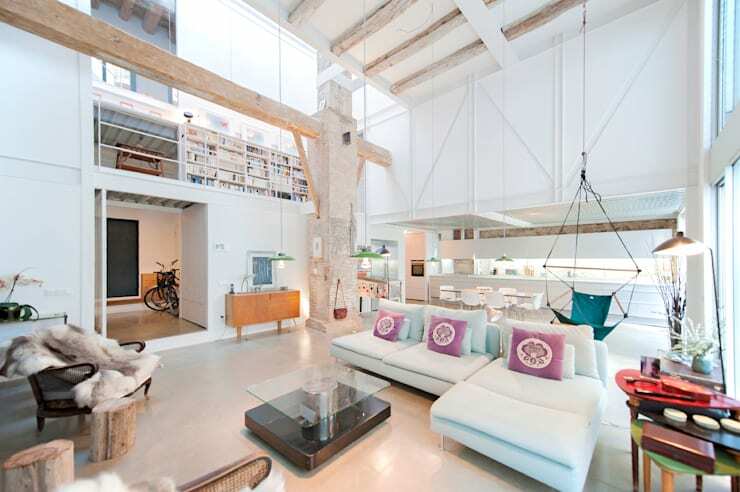 Rustic, wooden beams serve to lift and strengthen the space, farming the lofty interior in a sense of tradition. Best of all are the novel touches incorporated within the house, from a hammock strung proudly within the living room to the cosy privacy of the high-walled courtyard. Let's take a tour and marvel at how it's all come together. The beginnings of this project were remarkable in their degree of difficulty, with the designers embracing a stark, empty and worn space, envisaging contemporary grandeur amidst its dank and dirty walls. The strength of the home's outer shell was all they had to go on, with the designers eventually giving birth to an entirely new concept, ready to stand the test of time. And the result is… breathtaking! The open expanse of this home is wondrous to behold, especially when compared to its underwhelming beginnings. Lifted ceilings and strong, exposed beams elevate the space, contributing an industrial edge to the overall aesthetic, while dashes of colour enliven the predominantly white walls and furnishings. The second level of the home is visible from this vantage, with brimming bookshelves lining the mezzanine corridor, adding a sense of style and character. Simple, chic furnishings populate the ground floor, inviting relaxation within the open living area. 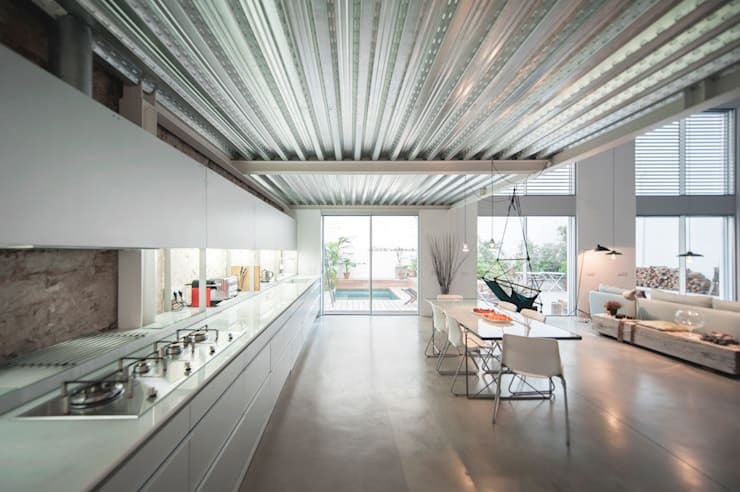 The kitchen appears modern and streamlined, with the silver of the corrugated ceiling stretching right through to the courtyard beyond, elongating the space. The impressive length of the kitchen bench runs parallel to the stunning simplicity of a contemporary dining table, with each contributing to the clean lines characterising this area of the home. Ample storage conceals kitchen clutter, generating a sophisticated atmosphere, and the smooth sheen of a polished concrete floor adds another industrial touch in keeping with the home's prevailing design concept. This vantage of the living and dining areas beautifully showcases the synergy of modern and industrial design in tandem, with bright white surfaces combining with exposed brick and the silver ceiling to delightful effect. 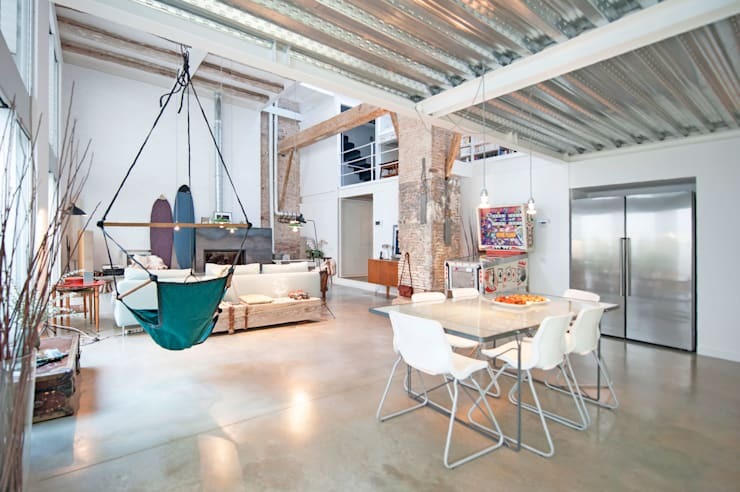 The green hammock dangles playfully, hanging around to accommodate casual comfort, and a pinball machine is stationed in the far corner, laying in wait for big kids to relive their childhood in the comfort of this cool, modern home. 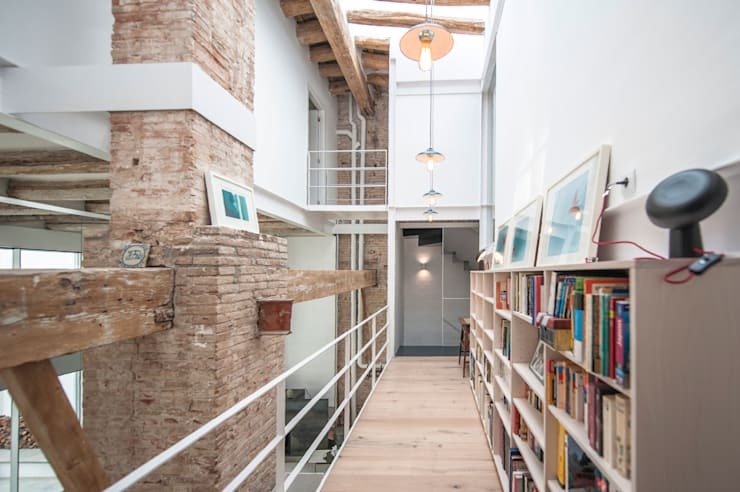 The exposed brick visible throughout the home adds rustic, industrial charm, combining beautifully with the strength of the ceiling beams and the homely warmth of displayed books and photographs. A veritable library is on show in the mezzanine corridor, creating a point of personal interest and sprinkling the open plan of the home with colour, even from afar. Decorations and photographs have also been tucked into cosy ledges on the bricks and beams, meaning that no nook or cranny is devoid of unique decoration. The master bedroom is peaceful and restive in stunning white, offsetting the industrial edge of its walls with light, pristine finishes. A generous array of wardrobes have been included to reduce clutter, with the result that a smattering of photographs retains prime focus in the room, adding to the sense of personal character permeating this home. Best of all is the stunning bathroom standing resplendent behind its glass enclosure. The space appears contemporary yet cosy, with overhead lighting illuminating the unique curves of a sculpted bathtub, inviting indulgence and relaxation. The courtyard of this lovely home rests in privacy behind high, white walls, inviting relaxation while shielding the occupants from nosy neighbours. The soft finish of wooden decking frames the aqua blue of a large spa, perfect for summer socialising outdoors. 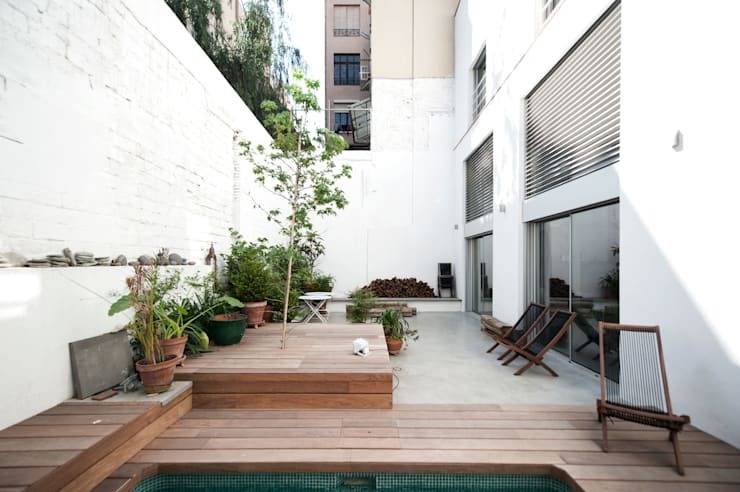 A rustic array of pot plants decorates the courtyard in vibrant green, with the space also housing simple, wooden furnishings in keeping with the tones of the decking. 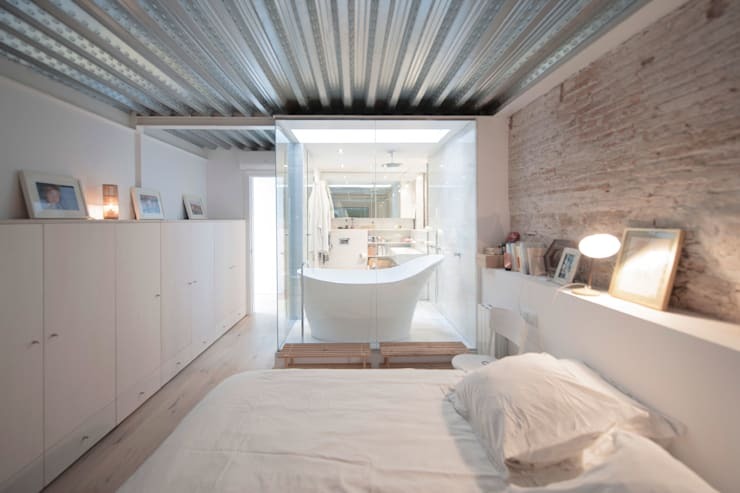 For more renovation inspiration have a look at Before and after: renovation of a traditional house, Porto. Do you prefer classic or industrial interior architecture? Tell us why below.